This is the hot season for new camera introductions to be entering the market and 2012 is shaping up to be one of the hottest years in camera technologies in quite some time. The fact is that camera makers are having a bit of a hard time. There is no question that more and more people are taking pictures with their smart-phones and some of the latest camera phones take some impressive pictures, especially in well lit environments. Just check out some unretouched pictures from Apple's latest iPhone 4s! So the camera manufacturers are creating additional value propositions as consumers move up the scale beyond standard point-n-shot cameras. And I recently wrote a note about Nikon's big 2012 line-up and I see the same level of intensity coming from other manufacturers...especially Canon and Panasonic. Canon started out late last year with the introduction of the successor to the popular S90/S95 compact performance cameras. This camera features a high-end array of features including an all-new 12.1 megapixel image sensor, bright F2.0 lens and powerful new image processing technology that is a substantial upgrade from their previous models. You've heard me rave about the S95 and this S100 (I have both)...and I have to say that the latest S100 is a great camera, it is a marvel of small size and very good image quality especially when taking nice, bright pictures in the shorter zoom range (1x-3x). This lens lets in a lot of light for a camera so small and allows you to take many indoor photos even without a flash. The addition of a slightly wider-angle (24mm) is a nice boon but increasing the zoom to 5x did introduce some compromises on the the brightness on the latter end of the telephoto range. I wouldn't use this new level of zoom unless you are outdoors on a nice sunny day or well illuminated environment. Another popular use for this camera at our household is as our "go to" video recorder. 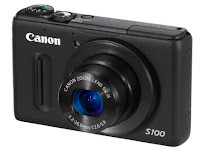 And the new S100 adds the ability to quietly zoom while recordings which is a very nice addition. We find that 80-90 percent of our family video shoots, we use this camera over pulling out a full camcorder. The S100 introduced full 1080p video resolution versus our old S95 at 720p. Sadly, the battery life has gone backwards on the S100 from the S95 which is a bit of a shame. But I still highly recommend this camera, it really satisfies the "you can only take a picture, if you have a camera" and the S100's size is truly pocketable. 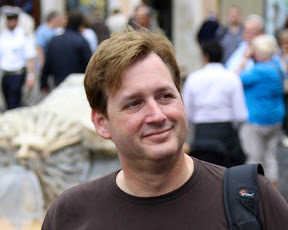 The images can frequently be confused for pictures from my higher-end digital SLR cameras. This is something I carry around with me all the time. And most of the pictures I share with friends and family come from this camera. If you have the S95, it is really not enough of an upgrade to justify the move. The update includes a longer 5x zoom starting with a respectably wide 24mm and going all the way up to 120mm, GPS and 1080p video capture with zoom. If you don't have a quality, easy to use and pocketable camera...this is the one for you. In an effort to fill the void between "point and shoot" and "digital SLR" cameras, Canon is taking the approach of a compact, all-in-one design (camera body and integrated lens) where you get an all-new 1.5 inch 14 megapixel image sensor that is substantially larger than your traditional compact cameras (approaching Digital SLR size) and an integrated 28mm wide angle / 4x zoom lens allows this camera to be a good compliment to someone looking for a second camera to support their larger DSLR camera. I've played with this camera a far bit and have mixed feelings about this new, first-generation offering. Canon is taking a different tack versus their competitors that are offering small, professional-styled compacts with interchangeable lens. Canon integrated the lens and while this adds a lot of convenience in a compact form factor, I also believe this is giving the camera some serious weaknesses. The first thing you will notice is that focusing is not as fast and crisp as some of the competitor offerings. Where this camera shines though is in its large sensor that captures light more cleanly thus affording some very impressive low-light pictures and bright, clean pictures overall. See sample to the right. I'd say this camera feels a bit first generation and has huge potential to improve over the years. 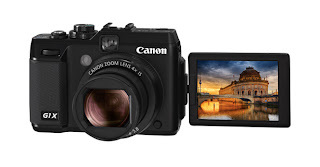 For now I would lean toward the Canon S100 which is MUCH more pocketable if you want a small, secondary camera that offers a decent amount of control. Or if you looking for more of a step up than the S100 offers, I would recommend the Canon G12. 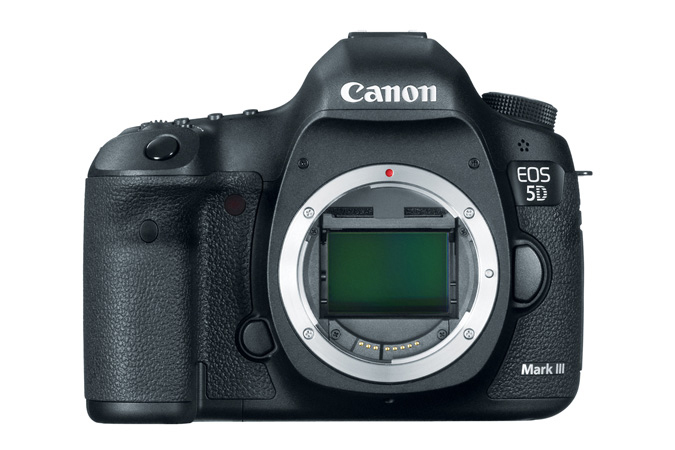 Now we are really leaping into the upper regions of the Canon camera universe with the newly introduced 5D Mark III. This is a semi or professional digital SLR (DSLR) camera that offers an impressive 22 megapixel full-frame sensor. This is a very large sensor, most sensors in the consumer DSLR realm are "cropped" and only have a fraction of the size of a full-frame (same image sensor real estate equivalent to a 35mm film photograph). Though it looks quite similar to the Canon 5D Mark II (note: this is my current "go-to" camera), the 5DM3 is an all-new design on the inside and really leverages some innovations in the Canon crop sensor space from the hugely successful Canon 7D. But this new camera one ups almost ever aspect of the previous Canons before it. The new 5DM3 leverages the 61 point Auto-Focus system from the top-end Canon 1DX and offers a huge ISO range of 100-25,600 to allow for some impressive low-light and high-speed photography. At the core is a new Canon Digic 5+ processor which adds much needed horsepower to a camera handling large images. You will also find support for UDMA 7 Compact Flash cards as well as dual memory card slots accommodating Compact Flash and SDXC cards. It is really hard to compare the 5DM3 versus the 5DM2. While they look almost identical except for a few tweaks here and there. The insides are completely different and really have evolved based on the needs and feedback of professionals to provide a fast and adaptable camera. The old 5DM2 was focused on megapixels and image clarity that proved a great landscape camera but the older camera was a bit slow on its focus. This new camera is notably more accurate and faster. While I will go into a more in-depth review in the near future, suffice it to say, I am impressed with this new camera and it is right in my wheelhouse of features and capabilities. But I am a bit torn between the Canon and its direct competitor...the new Nikon D800. I do tend to prefer the color gamut of the Canon over the Nikon's almost surgical imagery. Typically I like to "make a recommendation" on this blog. I tend to point out my personal preferences and point out why I feel that way. But on this last category of product, I just haven't pulled the trigger on either yet as I need to spend a bit more time with both the Canon 5DM3 and the Nikon D800 before deciding. Regarding price, the Canon 5DM3 and all it's horsepower comes at a price...$3,499 for just the body vs the original 5DM2s $2,699! There is no question, the 5DM3 is a much needed upgrade. I would love the improved speed, some notable improvements in some photographic technicals like how it handles color-fringe correction, metering and it's advanced focus system. And if you are vested in Canon lens...this is a great update and highly recommended. But I have both Canon and Nikon gear and from a pricing standpoint, the Nikon D800 is priced at $2,999 for the body and comes with an impressive 36 megapixel sensory plus all the other updates mentioned in my previous Nikon 2012 write-up. And my 5DM2 is still a solid performer. Hmmmm???? If you have some questions or thoughts about this, please comment.